I love setting a pretty table. 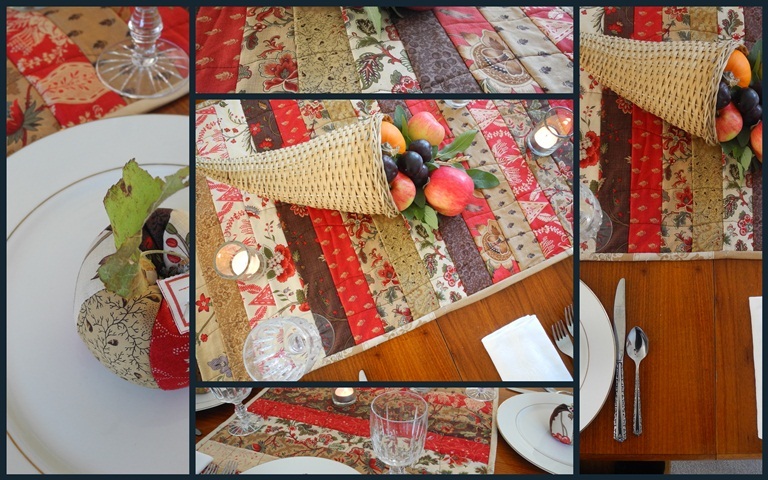 For Thanksgiving Dinner this year, I'm using the table-runner I made a few weeks ago, and the fabric apples (click for the link to the tutorial) as place card holders. The centerpiece looks nice, but is usually removed when we serve the main course to make room for the platters of turkey, potatoes, stuffing, vegetables and cranberry sauce. I also like using the linen dinner napkins that were a wedding gift to my in-laws more than 50 years ago. How many dinners have they witnessed? Little Miss A sits in a high chair and would likely try to eat this fabric apple. Little Miss S will lie on a blanket in view of us all. But I couldn't resist adding their names to our table as well. We will miss our son and daughter-in-law, vacationing in Europe. Linking to Mosaic Monday, hosted by Mary of the Little Red House., which will be up around 6:00 pm Pacific time. Lovely table for Thanksgiving. Love all the homemade accents! Happy Thanksgiving. You sure set a lovely table. The runner is perfection for Thanksgiving and the little fabric apples are so cute. I'll be coming back by for the tutorial. Those quality linen napkins have stood the test of time. That's the joy of good linen...it just keeps getting better. Ackk...you're going to shoot me. I can't remember three things at once. Meant to tell you that I made apple crisp with your recipe for the custard sauce today. We both enjoyed it so much. John still thinks he could have vanilla ice cream, but I'll never go back. Never! A mighty fine table you have prepared, Lorrie. Love the runner and the apples. Have a most blessed time with your family as you gather with Thanksgiving. The fabric apples are beautiful Lorrie! Love the handmade touch that you've added to your table setting. The runner is beautiful too! A perfect table setting for Autumn celebrations Lorrie, it all looks beautiful. As you can probably guess I love French General fabrics! It's been a while since I visited my patchwork shop - trying not to spend, however I have to go and see if they've got all the Maison de Garance range. A few of these fabrics I haven't seen before,like the tiny lavender sprig - very sweet! What a lovely table, I smiled through this whole post! I love how pinning the name tags to the apples suggests a pincushion -- very clever. I hope your day and your meal and your time with your family was all-out wonderful. Your Thanksgiving must have been particularly special this year, with two little 'Misses' at the table! The table is, indeed, very pretty and will have planted a seed, even this early, in the minds and hearts of those two little Misses. Happy Thanksgiving! Beautiful table setting. Ours usually ends up like a picnic! Pretty table! I like how you are using your apples, and simply sticking a pin to them, which makes me think they would also make good pin cushions! Would be a neat gift idea. And I like your stones of thankfulness. Hope you are having a nice weekend together! You are a very creative lady. That is a beautiful table. I know you had a wonderful day! We have so much to be thankful for! I love the colors of your table runner! Enjoy your week! Your table looked beautiful! I'm sure it was a most memorable time...with your two little misses joining you. Your Thanksgiving dinner looks almost like Christmas.